If you remove California (which enrolls about 10 percent of the nation’s full-time public four-year college students), those numbers drop to 7.4 percent and 7 percent, respectively. That’s because California jacked its prices for public four-year colleges a whopping 21 percent this year. Hence the student protests last spring. One of the econ professors from school (20+ years ago) made a big deal out of the fact that medical expenses, legal expenses, and higher education expenses have been outpacing inflation and cost-of-living, and they've been doing that while lots of other things have actually gotten cheaper. How do legal expenses look in the graph above? Also, is the correlation (assuming one exists) causal in nature? It seems logical -- a career in medicine, law, or education requires a trip through the higher education system, after all. What is the financial impact on CA tuition with the CA Government passing the Dream Act this past year? 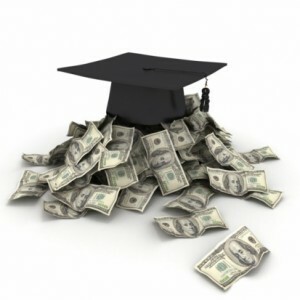 Are we facing a college cost/college debt crisis and prices and debt spiral upward? Are we near the tipping point and what will happen when we get there? Will some colleges fail? Will our economy tank? Is this growth fueled by the "subsidies and tax credits"? These are two of the most inefficient, technology adverse industries in the country. No coincidence they outpace inflation. They aren't adverse to technology, technology simply doesn't exist that can adequately increase productivity. That's like saying that writers are adverse to technology because they don't use computer programs that auto-generate great novels. As someone who has had the misfortune to experience online classes I can tell you that there is simply no substitute at this time for a trained human being with a good deal of natural talent from standing in front of a small group of people for 3 hours a week and then being closely involved with their learning. Moreover as the skills that a well rounded person needs to succeed increase colleges have been forced to invest in providing those opportunities. College isn't about getting people to pass standardized test, its about a highly personal experience, and unfortunately that sort of thing can't, as of yet, be automated. "There is a (very) small silver lining: the amount of available subsidies and tax credits have roughly doubled since 2007, from about $7 billion to an estimated $14.8 billion. " Umm... "silver lining"? If I have $100 that I'm willing and able to spend on education and Uncle Sam coughs up a $10 subsidy, how much am I now willing and able to pay? How much do you think the school is going to charge me? I'm betting $110. I think your silver lining is a trojan horse. 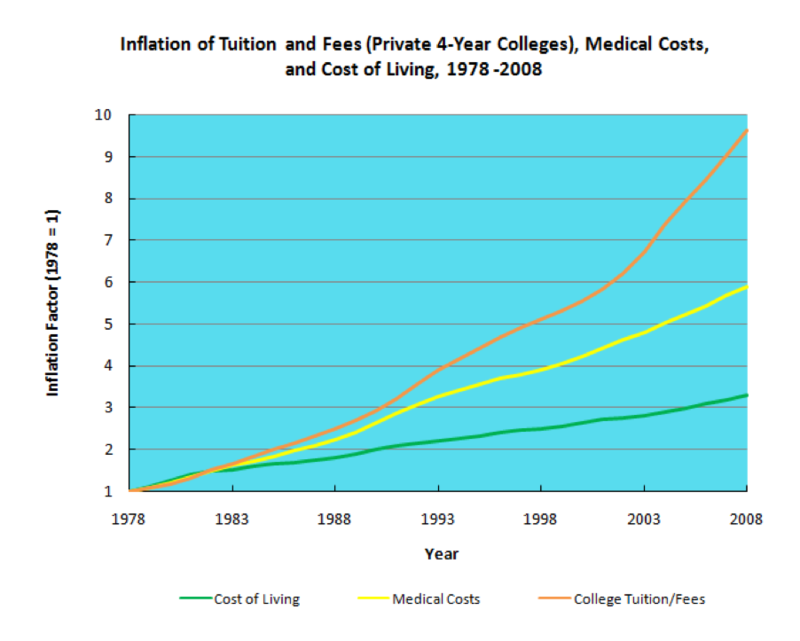 The graph could be make more shocking by adding the cost of medical school. It seems fitting that I had also just read this statement on a different blog which may point to why college costs have been going up so much. It also noted another University shrinking and merging their Physics department while increasing the size of several diversity centers. You should add to the graph U.S. median wage, which (inflation-adjusted) as been bouncing flatly along since 1970. When the main consumers of a good are told it will solve most of their future problems, and are given access to a lot of free/low interest money to purchase this good at an age where they are manifestly unprepared to actually make such a decision what do you think they will do? I think if students had to pay for their own schooling and were made to work for a few years before hand you would see fewer $800,000 sculptures in the library and a little more restraint and efficiency on college campuses. I was on a student governance committee once where they gave us $200,000 to spend on technology. We had tons of new technology and didn't want the money and asked if it could go towards tuition reduction or more professors instead. They said no it had to go for technology. SO we bought one department laptops for every student. There was an 11% tuition increase that year...in fact there was a double digit tuition increase every year I was in college. Why doesn't the graph include public college? Not clear what this graph is supposed to show. The vertical axis has numbers 1-10, but no label? Is it supposed to be annual percentage increase? If so, it seems wrong. Private university tuition has been increasing at a rate above the CPI but it certainly has not been increasing at annual percentage rate of 8 - 10 %. Some explanation of the graph would be useful. What do the numbers on the vertical access mean? And what is the source of the data? Look forward to some clarification. Thanks. The numbers are ratios, comparing each figure to the 1978 baseline. Thus, they are all 1.00 at the left side of the graph. The only thing about college educated economists asking about the worth of college is that they already have been to and paid for college several times over. Was the knowledge they acquired at University useful in their writing of national bestsellers, and sponsoring a website? The real question as it relates to the income of a caollege graduate is: would you rather spend your time on this earth chasing dollars and be paid for your efforts over a lifetime or would you rather be paid for your knowledge and what you know? If you would be OK chasing dollars for your career then college is not necessarily a good choice. Onthe other hand someone taht is 18 years old is fully willing to spend over 5o hours making a living in a trade or in retail or in sales of widgets. When that 18 year old gets a family and had other priorities, then the value of a college education changes dramaticly. The doubling of amount of available subsidies and tax credits for education is what is causing the bubble in the cost of education. Is adding more money to the system going to bring down costs, or will it allow costs to continue to rise? I'm in the process of setting up a 529 plan and I couldn't help but think that if everyone does this, and lots of parents have sizable piles of money which can only be spent on education, won't there be less pressure for institutions to hold costs?